Lauria always loved animals and always dreamt of owning her own business. As a kid she created a floor plan for a highend pet resort. “It had a pool and everything,” she says. She was a full time student at Fairleigh Dickinson University, and working at a grooming salon when her boyfriend of seven years called it quits. “If he hadn’t broken up with me I might never have started this business,” says Lauria with a laugh. 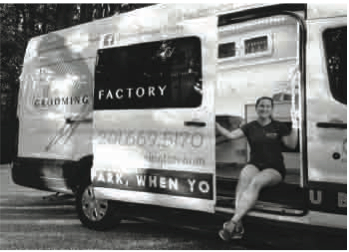 She quit her job and contacted a company in Indiana manufacturing mobile grooming vans. With 20K saved up by working since she was 14 and a loan from a relative, Lauria risked everything and ordered a van. By January 2011 she was in business. “I told everyone I knew I was getting the truck,” she says. She drove it around to run errands and parked it in the center of town to advertise. Her first day on the job she had one client - the dog of a friend, but within a year she was averaging six dogs a day, five days a week. Within four years she paid back the loan (with interest), hired an assistant, and this past August, purchased a second truck. Lauria goes to yearly grooming seminars in NJ and PA. She can do fancy show cuts, but says most of her clients prefer short and scruffy puppy cuts. She talks with owners beforehand so there are no surprises. “Every dog is a little different, and every client wants something different with their dog,” she says. The best measure of Lauria’s success may be that time management is a challenge. Lauria’s dad, a CPA, pitches in with bookkeeping, but everything else is up to her. Before or after ten-hour workdays she contacts new clients and sends out email appointment reminders. She works out regularly to stay fit enough for the physical demands of the business and still finds time to pay attention to her own three dogs, Mingus, Blue and TJ, along with her pet hedgehog, Harrington. It’s a grueling schedule, but one that so far she says she enjoys. “I’m a workaholic…it might be a fault of mine,” she says.